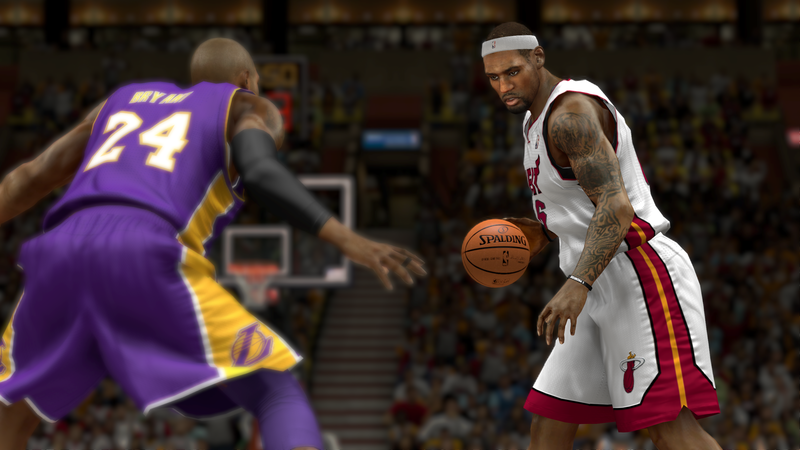 So Kobe Bryant is expected to play against the Cleveland Cavaliers on Thursday, preserving the Kobe Bryant-LeBron James showdown. 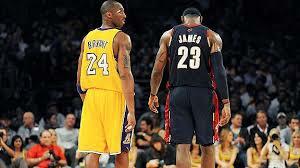 The Lakers are also expecting to have other reinforcements. 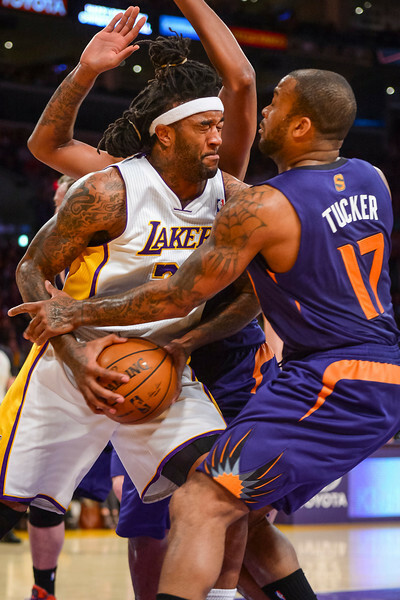 Jordan Hill became the latest casualty of an injury-riddled lineup that cannot stay out of the trainer’s room. He experienced a migraine on Sunday, but he still suited up in the Lakers’ 102-90 loss Sunday to the Memphis Grizzlies at Staples Center where he posted 10 points on 5 of 9 shooting and 10 rebounds. “It went away,” Hill said after taking some Excedrin to relieve the pain. If only the other Lakers’ injured players could heal so quickly. The Lakers have season-ending injuries to Kobe Bryant (fractured left knee), Pau Gasol (vertigo) and Xavier Henry (torn ligament in left wrist, bone bruise in right knee. The Lakers are also without Steve Nash (nerve irritation in back) and Chris Kaman (strained right calf). Through all the missed defensive rotations, the absent rim protection and a missing source of energy, Jordan Hill sat on the bench without any chance to fill those needs. Lakers coach Mike D’Antoni gave Chris Kaman and Pau Gasol a chance to start together in the team’s 124-112 loss Tuesday to the Portland Trail Blazers, but the sudden willingness of faith both exposed the tandem’s rustiness and left Hill among the few falling out of the rotation. 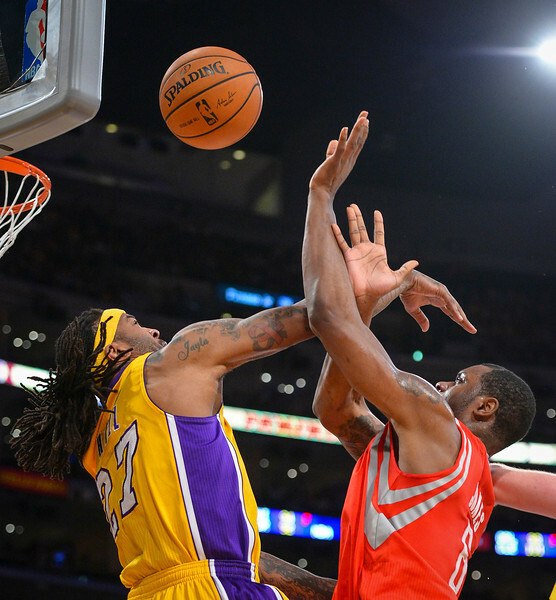 The cuts all along Jordan Hill’s face have since hardened, the bruising images personifying a day’s worth of labor where he battles in the paint, fights for rebounds and boosts the Lakers’ energy. Hill hasn’t provided that job description for quite some time. Partly because he missed six games earlier this month because of a hyperextended right knee. Partly because Hill didn’t match Mike D’Antoni’s preference for smaller and quicker lineups that feature stretch forwards. Partly because D’Antoni sensed Hill’s energy level wane as fatigue caught up to him. But in the Lakers’ 103-94 victory Sunday over the Orlando Magic at Staples Center, Hill provided all the ingredients that made a key reserve for the past two seasons. So much that Hill’s career-high 28 points on 9-of-15 shooting and 13 rebounds in 28 minutes prompted D’Antoni to say he scrap his small ball philosophies and start Hill should this keep up. Though both Nick Young and Jordan Hill participated in the past two practices without any setbacks, Lakers coach Mike D’Antoni ruled both of them out for tomorrow’s game against the San Antonio Spurs at Staples Center. Instead, the Lakers are targeting Young and Hill to return this weekend either Friday against Washington or Sunday against Orlando. D’Antoni said both Young and Hill “looked okay.” Young has missed 14 of the past 15 games because of soreness in his left knee. Hill has sat out of the past seven games because of a hyerpextended right knee. Young has averaged a second-best 16.8 points, while Hill has averaged 8.2 points and 6.8 rebounds despite becoming a casualty of D’Antoni’s preferred smaller lineup. Jordan Hill sat by his locker stall in a relaxed state despite all the chaos swirling around him. This may have marked his last day with the Lakers, coming on the heels of a 134-108 loss Wednesday to the Houston Rockets at Staples Center. The Lakers engaged in plenty of trade discussions regarding Hill with various teams including the Brooklyn Nets, Phoenix Suns, Cleveland Cavaliers and Dallas Mavericks, according to a league source. Yet, Hill hardly sounded concerned on what scenarios might play out. But if it’s up to Hill, he’d like to stay with the Lakers right? Although the Lakers engaged in preliminary talks about a trade that would send Jordan Hill to the Brooklyn Nets, the deal likely will not happen, according to a league source familiar with the situation. The main reason: Brooklyn would absorb a $17 million luxury tax penalty for acquiring Hill’s remaining $3.5 million on his expiring contract. Brooklyn has some flexibility considering its $5.25 million disabled player exception could be used to absorb Hill’s contract. But that doesn’t erase the luxury tax implications. The Nets would then have shelled out around $190 million in combined payroll and luxury tax. 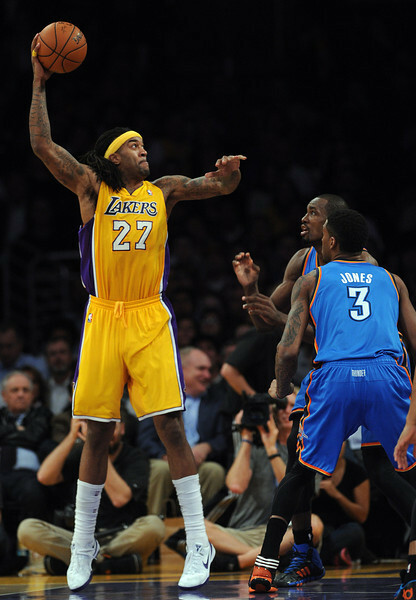 Will Jordan Hill expand his game? The job description Mike D’Antoni provided for Jordan Hill represents a perfect case study on both a player’s evolution and a coach’s perception of him. Four years ago, D’Antoni found so little use for Hill as the New York Knicks’ eighth overall draft pick that he hardly played his rookie season before getting shipped to the Houston Rockets. Nearly a year ago, D’Antoni sat Hill for three consecutive games because he saw no value in how he’d fit into a offense predicated on outside shooters until his endlessly valuable and defense convinced him otherwise. During this offseason, both D’Antoni and Kobe Bryant both instructed Hill to work on his mid-range game, an order the Lakers forward took to heart by taking between 600-700 shots per day at his Atlanta residence. D’Antoni remains undecided whether Hill will start at power forward alongside Pau Gasol or if he will come off the bench. But D’Antoni remains adamant that Hill can become an effective mid-range shooter without diluting his effectiveness as an energy player in rebounding and on defense.